Dialysis is a process that duplicates kidney function for patients with failed kidneys by reducing waste and excess fluids. Without frequent and ongoing dialysis treatments three times weekly patients cannot survive. There are two primary types of dialysis; hemodialysis and peritoneal dialysis. Both are based on principles of osmosis and diffusion. Osmosis is the tendency of water to move from a low concentration of particulates to a higher concentration, and diffusion is the tendency of particles to distribute evenly throughout a solution leading to homeostasis. Together, osmosis and diffusion, working in conjunction with a membrane of some sort, comprise dialysis. Blood cells are too large to pass across the semi-permeable membrane used in dialysis, however, waste in the blood, consisting of excess water and other impurities, is transported across the membrane and out of the body with the help of a solution. This solution, located on the other side of the membrane, is separated from the blood and contains sodium, potassium, calcium, magnesium and other electrolytes. This solution is called dialysate and it makes dialysis possible. For a small percentage of ESRD patients, peritoneal dialysis is chosen, which uses the lining of the patient’s abdomen as the dialyzing membrane. This lining is called the peritoneal membrane (thus the name peritoneal dialysis). The majority of patients receive hemodialysis in the U.S. and world-wide. The treatment for the majority of dialysis patients is hemodialysis (also called kidney dialysis). 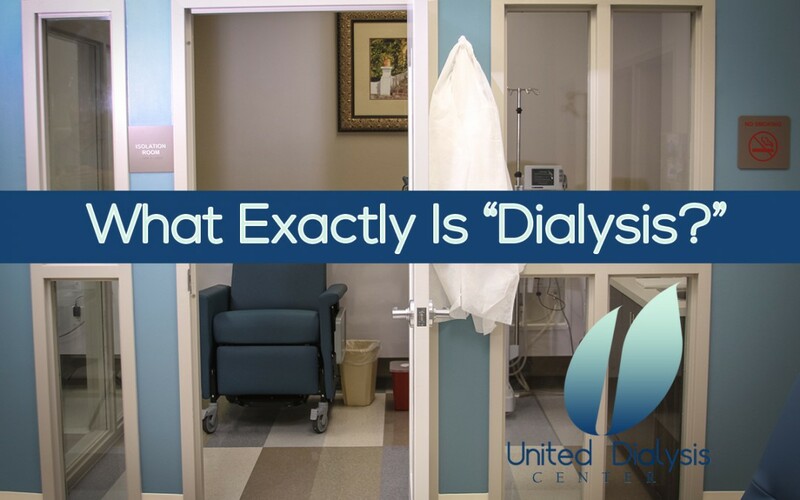 The vast majority of patients are dialyzed in a free-standing dialysis clinic (chronic patients) while a relatively small number are dialyzed in a hospital (acute patients) and at home-based renal therapies (home and peritoneal dialysis). There are currently over 6,400 dialysis clinics in operation in the United States. Hemodialysis treatment usually lasts four hours and is performed three times a week. During this procedure, blood is carried from the patient to a dialyzer (artificial kidney), which is a device comprised of thousands of very fine hollow fibers. These fibers create a semi-permeable membrane and as blood flows through inside the membrane dialysate flows in the opposite direction on the outside, removing impurities and excess water and properly adjusting the chemical balance of the blood. The “clean” blood is then carried back into the patient. During treatment, patients are connected to a dialysis machine so movement is limited, however they are usually positioned in a comfortable chair and may read, write, watch television or sleep. During dialysis less than five percent of a patient’s blood is outside their body at any time. However, 5-7 mg of iron is permanently lost during every treatment session, and as these iron losses accumulate over time, iron deficiency develops – leading to iron deficiency anemia. Contact United Dialysis Center in Pompano Beach, Florida for more information regarding Dialysis and Hemodialysis.